I hope the subject line of this post, Let’s Talk About Sin, caught your attention! 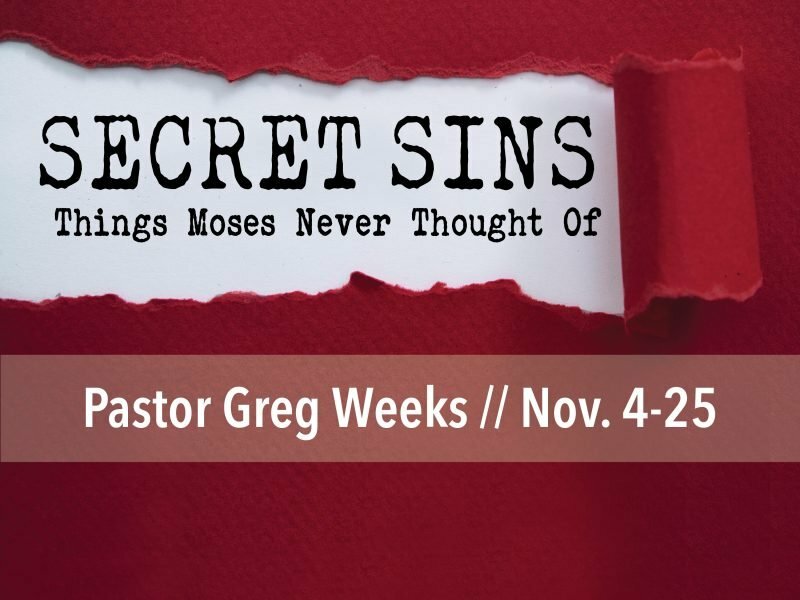 Starting this Sunday, in traditional services, I’m beginning a series titled, SECRET SINS: Things Moses Never Thought Of. We live in a world quite different from Moses.’ Things are fast-paced, and we sometimes say/do/think things without taking time to first reflect. In so doing, we pay the price in our relationships and our emotional/spiritual well-being. I’ll be looking at some of these secret sins, so we can expose them, avoid them, and seek God’s grace. The guiding Scripture for this is Jesus’ words in Luke 12:2-3: Nothing is hidden that won’t be revealed, and nothing is secret that won’t be brought out into the open. Therefore, whatever you have said in the darkness will be heard in the light, and whatever you have whispered in the rooms deep inside the house will be announced from the rooftops. In the month of October, we’ve been taking a look at “The Acts 4 Church,” which serves as our role model today. We talked about common purpose, place, possessions, and praise. Last Sunday at the close of service, we dedicated our pledges and special gifts to the Unfinished generosity initiative. Please know how deeply I appreciate your generosity in supporting God’s work at Manchester UMC. You truly are helping make miracles happen. Thank you! I’ll write more about this event in next week’s eblast. However, you can get a heads now up with the information online. Meanwhile, mark your calendars. You won’t want to miss it! No Midweek Chapel this week because of Halloween. Our final chapels for fall will be November 7 and 14.